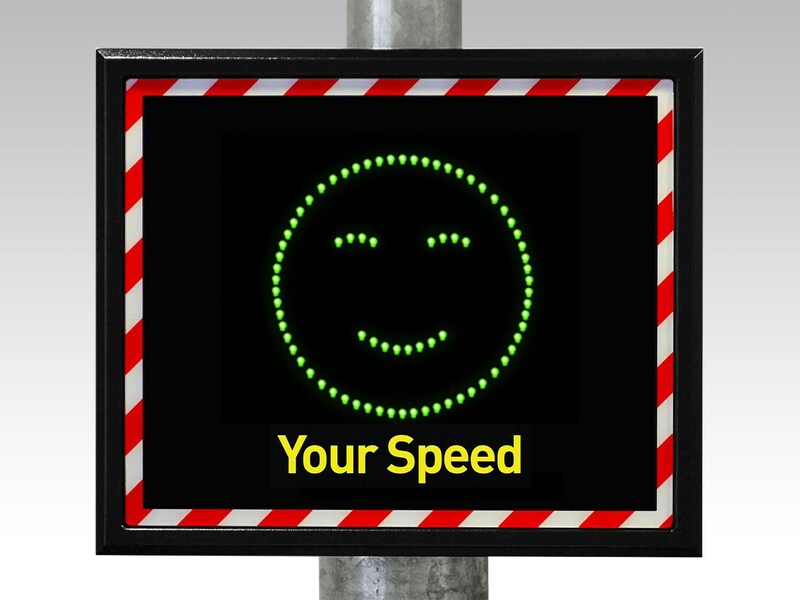 The green smiley face and red sad face on the TEMPODIS 230 S speed display gives clear signals to drivers when they are speeding. The bi-color display of the TEMPODIS 230 S speed display intensifies the positive and negative feedback. A bright red sad face gives drivers an even stronger indication whether they have exceeded the speed limit. If they are below the limit, a green smiley appears on the display. This enables increased traffic safety at potentially dangerous locations, such as outside kindergartens and schools, hospitals and nursing homes or on your own company grounds. TEMPODIS 230 S uses a radar sensor to measure the speed of approaching vehicles. The speed can be immediately seen on the powerful LED display, even from a distance of 150 meters. The LEDs automatically respond to the ambient light. The display remains bright and easy to see without dazzling even in bright sunshine and late at night. The speed display is clearly visible at all times. The device records up to 40 million items of data for speed monitoring. This includes speed, direction of travel, date and time. Statistical analyses can be easily performed on this information with the TEMPOVIEW software from Jenoptik and graphically displayed. The housing is made of laser-welded and powder-coated aluminum. It withstands all weathering and is extremely stable. The lockable housing, anti-theft bracket and polycarbonate screen in front of the display protect the device against vandalism and damage. The power supply to the speed display is provided by a power adapter (230-volt connection), a battery with charger or a solar panel. Two colors: Intensifies the positive and negative feedback for drivers with a green smiley face and red sad face. Powerful LEDs: Easy to see from a distance up to 150 meters even in bright sunshine. Reliable: TEMPODIS 230 S stores up to 40 million items of traffic data. Robust: The speed display is weatherproof and theft-proof. Urban centers: At potential danger spots, such as schools, kindergartens or hospitals. On your company grounds: On all your company roads and places where traffic safety is to be increased. The TEMPODIS 350 speed display is particularly suitable for speed monitoring on expressways and freeways.